Due to FAA regulations, item can ship via ground freight only. Shipping restrictions may apply on orders outside the Lower 48 StatesAdditional shipping charges may apply for this item for certain shipping methods. More than a piano, it's your home's entertainment center. With the MDG-400 you get a combination of stunning aesthetics, merged with high-end performance features and technology that will turn any room into the musical entertainment center of your home. It is perfectly proportioned and blends seamlessly with today' modern spaces and lifestyles. 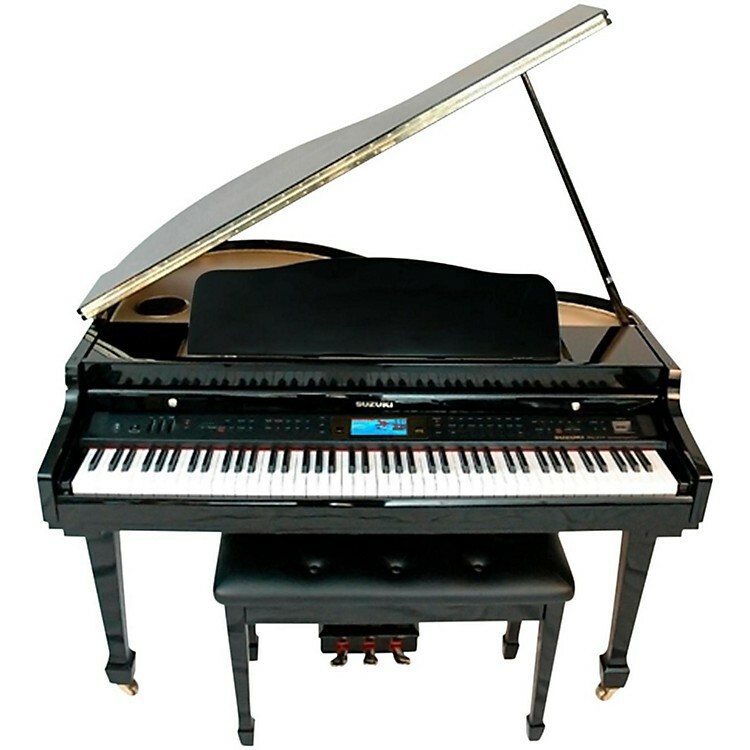 The MDG-400' enhanced performance features are rarely found on digital grand pianos in this price range, features including Bluetooth compatibility, a 4.3 True Color LCD display, 128-note polyphony, and an amazing 24Mb of powerful sound reproduction played through a 6 way stereo sound system. Create your own original compositions with the on-board 3-track music sequencer, then save and store them to the Secure Digital (SD) Memory Card. Whether you are just starting out or an accomplished musician, the MDG-400 is ready to perform for you. Try one soon and see why you, and your home, will want one! Suzuki's acclaimed sound imaging technology and 24 Mb grand piano voice are used to create remarkable depth, expression and realism. Instrument voices use 3D sound source sampling for incredible dynamic response. The MDG-400 features a powerful 6 speaker sound delivery system. High grade speakers and integrated tuned cabinet deliver a truly dynamic sound, rich with presence and power. As a tech titan, the MDG-400 includes the latest Bluetooth technology. Wireless networking enables any wireless device to connect to your MDG-400 Digital Grand Piano for expanded and convenient operation. Connect the MDG-400 to your iPad and convert it into a recording studio! Makes practice and playing time a lot more fun. If you have kids, it might make all the difference in encouraging them to practice! The MDG-400 has a USB port that opens a world of exciting add-ons and extra functionality. Plug and Play directly with your laptop or desktop computers. Or you can use the MIDI ports to transmit and receive data from other musical instruments or computer accessories. Secure Digital (SD) Memory Card includes 80 preloaded songs. Record your performance, playback hours of prerecorded music files, and create your own music library with songs you download from the internet using any SD Memory Card. The MDG-400 has a large 4.3 inch LCD display screen in full color to help organize your selected features. Find what you need quickly and easily with this large window format. An amazing combination of 122 voices, 100 rhythm styles and recording features create endless musical possibilities. Professional styles make you a member of the world class band of your choice. Rock to Bach, World Beat to Jazz ensembles, Boogie Woogie to New Age, your musical spectrum is limitless. The MDG-400 has a velocity sensitive, graded hammer action keyboard that offers superb response and smooth feel. Call or click to order today and bring the MDG-400 home.